Hepatitis E Virus is a major cause of enterically transmitted hepatitis worldwide. A third of the world’s population, some 2 billion people, live in areas where Hepatitis E Virus is endemic. First a bit of a horror story: Hepatitis E was first described in 1983 when scientists reproduced Hepatitis E Virus infection in a healthy volunteer who ingested pooled stool extracts from patients presumed to have non-A, non-B hepatitis. Hepatitis E Virus infection develops in most individuals as a self-limiting, acute, icteric hepatitis. Mortality rates hoover around 1%. Some affected individuals will develop hepatic failure, a serious condition that is frequently fatal without a liver transplant. This complication is particularly common when the infection occurs in pregnant women, where mortality rates rise dramatically to up to 25%. 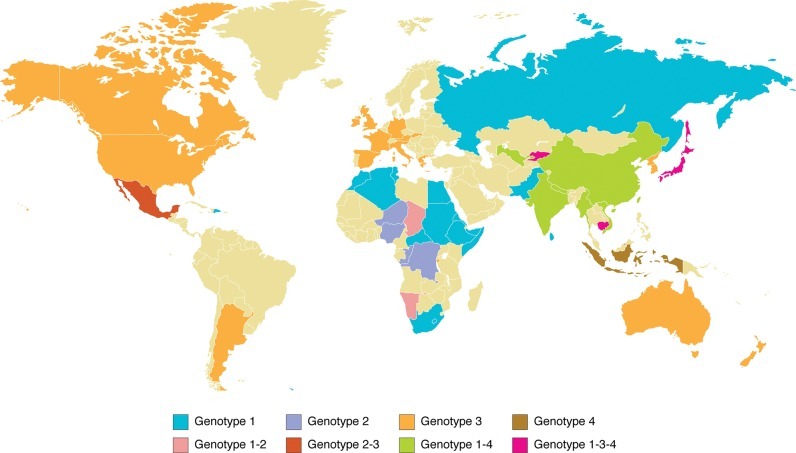 Although only a single serotype of Hepatitis E Virus has been identified, there is great genetic variation among the different Hepatitis E Virus isolates. There are at least four major recognized genotypes of Hepatitis E Virus: genotypes 1 and 2 are mainly restricted to humans and linked to epidemic outbreaks in non-industrialized countries, whereas genotypes 3 and 4 are zoonotic in both developing and industrialized countries. Thus, Hepatitis E Virus is the only one of the major Hepatitis viruses (A, B, C and D) with an animal reservoir. The discovery of Hepatitis E Virus in pigs (swine HEV), chickens (avian HEV), and, more recently, in rabbits, rodents, wild boars, ferrets, bats, sheep and cutthroat trout, as well as the successful experimental transmission of swine Hepatitis E Virus to macaques (model for human Hepatitis E Virus transmission) supports a zoonotic origin of Hepatitis E.
One possible explanation for the great genomic variability of Hepatitis E Virus is an animal origin. Analysis have shown a close relationship between swine and human isolates of the same geographic area in industrialized countries. Rabbits have also been suggested as a zoonotic source of Hepatitis E Virus. French researchers found that farmed and wild rabbits in France are naturally infected with Hepatitis E Virus. They also characterized a human Hepatitis E Virus strain that is closely related to rabbit Hepatitis E Virus strains; this finding thus supports the potential of zoonotic transmission from rabbits to humans. However, research showed that isolates from farmed, wild and pet rabbits in The Netherlands were distinct from most human isolates and are unlikely to be a zoonotic source.